The occasion was the dedication on Thursday of a memorial to those who fought for the British Army in World War One at Glasnevin Cemetery in Dublin. It was the latest in a series of official events to promote the notion of a “shared history” between Ireland and Britain in the colonial conflicts of that era, including the 1916 Easter Rising and Ireland’s War of Independence. Commentators and colour-writers worked to capture the atmosphere as “Duke of Kent” Prince Edward and a British Army colour party saluted the British national anthem. But there were tut-tuts when republicans disrupted proceedings by chanting, shouting and waving banners from behind railings over a hundred metres away. Except for those protestors outside, who loudly demanded a complete British withdrawal from Ireland, memories of those who died fighting for Ireland were excluded from the ceremony and the subsequent tea-garden reception. And despite the heavy rhetoric of reconciliation and a “multilayered sense of belonging”, no representatives of Britain’s chief opponents in ‘the Great War’ were invited either. The 26-County President Michael D Higgins and other invited dignatories chose to ignore the protest before Gardai eventually moved in with pepper-spray. Two were arrested for public order offences. 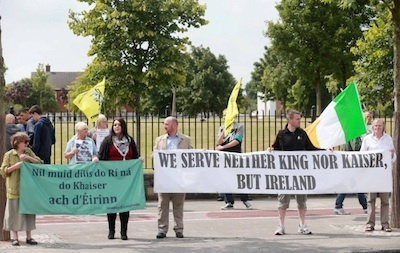 The 32 County Sovereignty Movement said members of IRSP, Republican Sinn Fein, Eirigi, 1916 Societies and the Dublin Anti-internment Committee, had “stood united” against the event. Condemning the police ‘intelligence’ unit as “the Free State’s bullies”, they said members of the Garda’s Special Branch Unit had “violently pepper sprayed the protesters from very close range”. In their statement, Republican Sinn Fein said the people of Ireland had heard the voices of protest “from those who will neither be purchased nor intimidated”. Spokesman Sean O Dubhlain said there was no underestimating the determination of the 26-County State to “destroy the legacy” of 1916. “In the past this state has murdered Irish Republicans on behalf of Britain, indeed under oath to the crown, but we will not be intimidated,” he said. He urged others to help organise opposition to other “events of collaboration” across Ireland.